It was very much a family show at Hamer Hall on the night of 14th August, when Kasey, Shane and Kasey's dad Bill stepped onto the stage. This included the audience, who, encouraged to regard themselves as guests at the Chambers' home, were charmed into acceptance by Kasey's warm and friendly introduction to her part of the evening's entertainment. But first, let us talk of Ryan Bingham, the young Texan singer songwriter who was on the second leg of his first Australian tour as support act for the local duo. 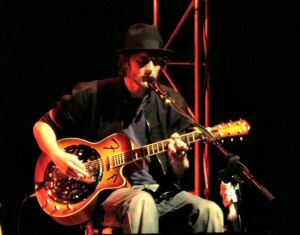 Bingham performed a short set, comprising a mere six songs, but even so impressed the audience with his obvious talent as a guitarist and singer. His ragged world weary voice is totally appropriate to his songs of life in the rough on the rodeo circuit. 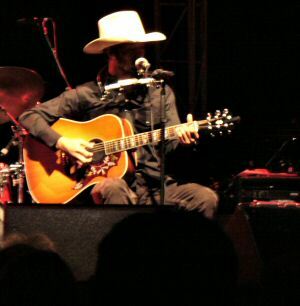 He sat for the main hunched over his guitar, cowboy hat obscuring his features, but that didn't really matter as the songs coming from the stage were interesting enough to grab the audience's attention. Among the six songs in his set he sang the opening track on his Mescalito CD South Side of Heaven, Dollar A Day and as a finale. a scintillating slide guitar driven Bread And Water. There was word that he would be returning to Australia early next year with his band The Dead Horses, so if you didn't catch him this time round you wouldn't want to miss his brand of Texan music when he does return. After a short break the Kasey-Shane part of the concert began in darkness with Kasey's voice emanating from the blackness of the stage, to be gradually joined by her husband and father harmonising a capella around a single mike on the gospel number, I Still Pray as the lights slowly came on. Still in gospel mode Last Hard Bible came next, sung solo by Kasey with Shane adding harmony vocals. 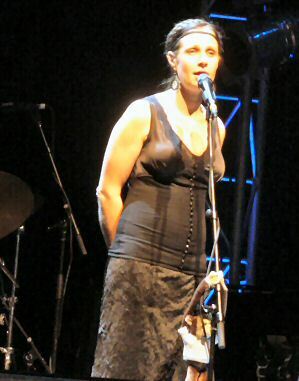 As Kasey explained the concert was divided into two parts, the first being a simple acoustic set to showcase her back catalogue in the company of Shane and Bill. The audience were asked to imagine themselves sitting in on one of their home jam sessions. Songs included Not Pretty Enough, Still Feeling Blue, Hollywood, Paper Aeroplane and Barricades and Brickwalls which song Kasey said was written in collaboration with her roadie Worm. The warmth and charm of Kasey's personality is a definite asset to her live shows, and now that her marriage partner is part of the act, she uses him as a foil in her between-song patter. She told us that she and Shane had a pact regarding Celebrity Freebees. The rules of the game precluded local celebrities so the freebee had to be someone well known and pretty well impossible to meet in person. Kasey's freebee choice was Jerry Seinfeld and Shane's was Sheryl Crowe. Shane quipped that Jerry Seinfeld was no threat to him at all. 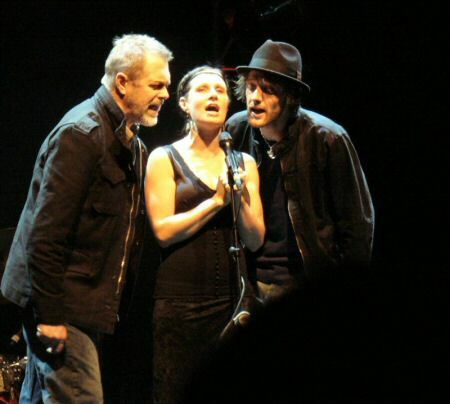 Kasey however said that they were in dispute about Sheryl Crowe since she would be coming to Australia later this year with John Mellencamp and Shane had been offered the support act spot for the two of them. Kasey claimed to be horrified by the implications, but she was obviously delighted at this belated recognition of his undoubted talents. This mock diatribe segued into a Shane Nicholson showcase of some of his own songs. These included Designed To Fade which is in fact the song that introduced the couple to each other when Kasey lent her voice to the original song on Shane's It's A Movie CD. She performed the same harmonies on the night, and then left Shane to perform a couple more of his songs with Bill Chambers providing his usual multi instrumental accompaniment. He had something like six stringed instruments to hand and swapped them regularly. After Shane's set the band came on stage. The band personnel were those who collaborated on the acclaimed Rattlin' Bones CD with John Watson on drums, James Gillard on double bass and Mark "Bucky" Collins on banjo. At Kasey's instigation the audience quickly responded to her request for favourite songs from the Rattlin' Bones CD and faithfully followed the order received in the response, starting with the title song Rattlin' Bones, then proceeding to Wild Flower, Once In A While and One More Year and somewhere in there was Monkey On A Wire. By this time we had been treated to something like 17 songs, but the night was not over yet. Before calling it quits, Kasey performed her song Pony from the Wayward Angel CD and Cry Like A Baby from The Captain before bowing off stage. Drawn back for an encore she sang The Captain title song, which she stated she has always included in every concert she has performed. Then to everyone's surprise she introduced a special guest lurking in the wings. It was Jimmy Barnes. He and Kasey performed a duet on the old Hank Williams song Your Cheating Heart. At the request of small child in the audience and with a wry shaking of her head that such a young person could identify with such a song, Kasey sang the Gillian Welch inspired Devil Inside My Head. The night ended with Kasey's standard closer We're All Gonna Die Some Day. It was a wonderful evening of music performed in the intimate surrounds of Hamer Hall and I'm sure the whole audience felt the warm vibes emanating from the Chambers clan on stage to such an extent that each one felt very much a part of the family.